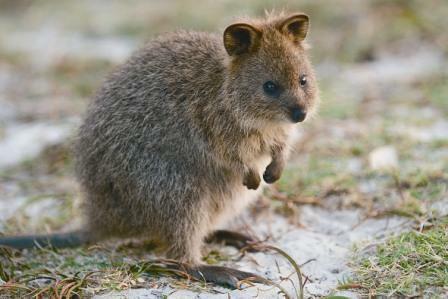 Today I want to write about a very interesting and cute animal called a quokka. These short, stocky marsupials are about the size of a cat, with a body up to 54 cm long and a long tail. They have an island named after them. When Dutch explorer William Dampier first found quokkas on Rottnest Island off the coast of Western Australia, he thought that they were rats the size of cats. He originally named the island Rattennest, which means rat’s nest and it was later changed to Rottnest. Unlike most other macropods (wallabies, kangaroos and similar species), they can climb trees. Quokkas feed at night on grass, leaves and bark. They also have the ability to survive for a long time without food or water, using the fat stored in their tails. They are considered vulnerable to extinction as they are mostly only found on Rottnest Island where increase tourism is having a negative impact on these cute little animals. They can also be found on another small island called Bald Island and on the mainland, although foxes, dogs and cats hunt them there. Are there any other interesting facts that you would like to share about quokkas?